celebrations organized by the local chapter of GOPIO. For many of the Invitees, it was discovery of a new, remote Caribbean island where people speak French but with Indian names like Ramssamy, Narayanansamy, etc. The conferences and commemorations were synchronized in accord with the memory of their ancestors who came from India and their living conditions. At the abolition of slavery in 1848, Indian indentured workers were recruited by the French colonial masters and they were taken to various French colonies, including Guadeloupe in the years 1854-1888. They had been recruited to work in the sugar cane fields and to facilitate the day-to-day life of the imperials of the époque. The events organized are full of emotions and sadness; while remembering that our ancestors come so far from their homeland to work, with the hope of a better life. For the majority of them, the life was very difficult in particular because of the long and painful maritime transport conditions and little consideration given to them as a human being on board these ships and their mistreatment continued even after their arrival in the Island. 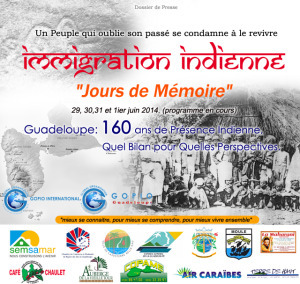 Thanks to the initiatives of GOPIO GUADELOUPE, and its members, who gave the opportunity to the Persons of Indian Origin of Guadeloupe to highlight besides to better know and include/understand their origins through the event “Remembrance Days”. The various events organized on the occasion included a conference-debate and of an exhibitions on Mahatma Gandhi on the themes of the ‘relevance of Gandhi in the modern world” and “Gandhi, life and message”. The exhibitions were organized to inform the local populations about the life and principles of of this great man who devoted his life to the human cause and more particularly to the greater comfort of the Indians. His ideas and messages are even more relevant nowadays; they continue to be the engine many actions across the world and a model for many great contemporary figures. The conference-debate, chaired by Mr. Mahyendrah Utchanah, Former Minister with the Government of Mauritius and present Chairman of GOPIO INTERNATIONAL, and Armoogum Parsuramen, former secretary general of UNESCO, former adviser in the World Bank and former minister with government of Mauritius, drew up an assessment of these 160 years of Indian presence in Guadeloupe and its prospects for the future. The overall program, with several interesting and diverse activities, was organized by Gopio Guadeloupe, led by Mr. Michel Narayaninsamy, President of GOPIO Guadeloupe. This program in the memory and commemorations which made it possible to pay homage to the men and women of Indian origin who came to this island many years ago.